Welcome to Tizen wearable Web watch application development! Create a wearable Web watch project using the Tizen Studio. When you are developing a more complex application, you can take advantage of the Web tools included in the Tizen Studio to ease the tasks of creating functionality and designing the application UI. The following example shows you how to create and configure a basic wearable Web watch application project in the Tizen Studio. An application project contains all the files that make up an application. The following figure illustrates the application to be created. The application screen displays the analog watch face and the current time, which continues to be refreshed every second while the application runs. Make sure the Web perspective is selected in the upper-right corner of the Tizen Studio window. If not, select it. If the perspective is not visible, in the Tizen Studio menu, select Window > Perspective > Open Perspective > Other > Web, and click OK. Select the Sample project type and click Next. Select the Web Application application type and click Next. Select the Watch > Basic Watch sample and click Next. NoteYou can view and modify the application configuration in the Web application configuration editor. In this example, no configuration changes are required. In the Project Explorer view, double-click the config.xml file of the application. The Tizen Studio opens the file in the Web application configuration editor. Overview: Define general information, such as the name and icon of the application. Localization: Define localized values for the application name, description, and license. Policy: Request network resource permissions to access external network resources. Preferences: Define name-value pairs that can be set or retrieved through the application. Tizen: Edit the Tizen schema extension properties of the application. Source: View and edit the source code of the config.xml file. Changes made and saved on the other tabs are reflected in the source code and vice versa. NoteThe config.xml file must conform to both the XML file format and the W3C specification requirements. Editing the file in the Source tab is intended for advanced users only. For more information on configuring the application, see Setting the Web Application Configuration. Pay attention to the following main issues in the application source code, to understand how the application is designed and how it works. For source code details related to the UI, see Designing a Simple UI. The watch application settings are defined in the config.xml file. 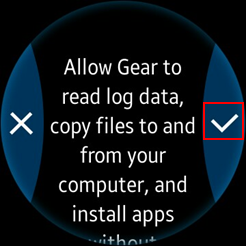 Note By default, the BasicWatch sample has the application category defined as <tizen:category name="http://tizen.org/category/wearable_clock"/>. To run your application on Samsung Gear 2, Samsung Gear 2 Neo, and Samsung Gear S devices, use <tizen:category name="com.samsung.wmanager.WATCH_CLOCK"/> instead. If the application contains a custom UI for the ambient mode, the ambient mode support is also shown in the config.xml file. However, this sample application does not support a custom ambient UI. You can run the Web watch application on the emulator or a real target device. NoteSince the Web Simulator does not support a circular UI, this topic does not cover the instructions for running the application on the Web Simulator. In Project Explorer view, right-click the project and select Run As > Tizen Web Application. The wearable watch application created with the Basic Watch sample has a simple user interface that consists of 4 images (background image and separate images for the hour, minute, and second hands of the clock). The hand images are rotated on the screen every second to show the current time. The UI is created using W3C/HTML in the index.html file. The W3C specifications provide HTML and CSS features for creating a user interface. With HTML, you can define the structure of the application screens, while CSS allows you to define the look and feel of the screens. <meta>: Defines information, such as encoding, creator, and keywords of the document. <style>, <link>: Sets the styles of the document. <script>, <noscript>: Adds functions to the document. CSS (Cascading Style Sheets) specifies the layout and styling of the Web application. Applying the style of an HTML element directly with the style attribute has the highest priority. On the other hand, creating a separate CSS file and managing it separately is convenient when it comes to applying changes in the future. The following lines in the CSS code describe the styling of the main UI elements using the IDs defined in the HTML file. Each main element is represented by a specific image file. The background image covers the entire screen, while the clock hand images are placed so that they start from the middle of the screen, and point up (showing by default the time at noon or midnight).